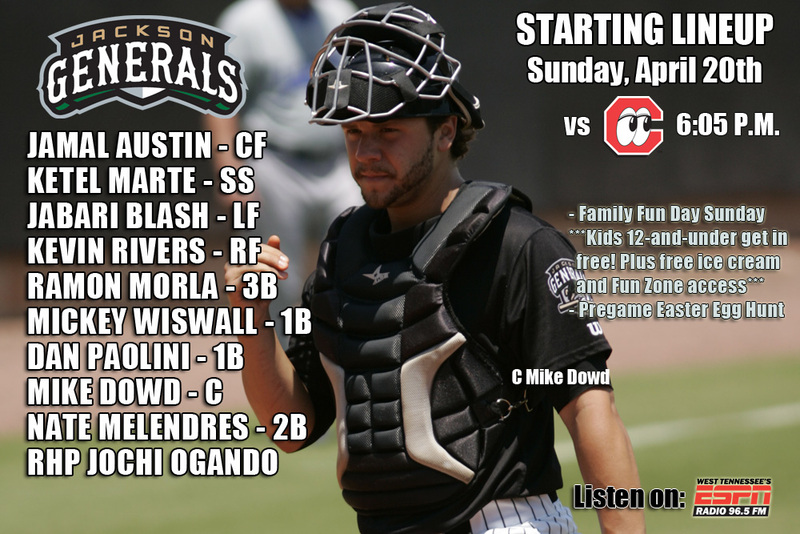 • The Generals and Lookouts play game 2 of the 5-game series tonight, with Chattanooga leading 1-0. • RHP Jochi Ogando makes his Double-A debut for the Generals and was 0-1 with a 3.38 ERA for A+ High Desert in 2 starts. RHP Tyson Brummett makes his 3rd start for Chattanooga and 1st against the Generals. • The Generals jumped out to an early 1-0 lead after the first inning, but couldn’t overcome a 3-run 2nd inning by the Lookouts as Jackson lost to Chattanooga 3-2 on Saturday. • RF Jabari Blash (2×4, SB) led the team with 2 hits, while SS Ketel Marte (1×3, R, 2 BB), 1B Dan Paolini (1×4), 3B Ramon Morla (1×3, RBI, BB) and LF Patrick Brady (1×4) each recorded 1 hit as Jackson out hit Chattanooga 6-5. • Starter Moises Hernandez (4.0,3,3,3,1,1) recorded his first loss of the season, allowing 3 runs on 3 hits in 4.0 innings. RH David Colvin (2.2,2,0,0,0,5), RH Stephen Shackleford (1.1,0,0,0,0,1) and RH Stephen Kohlscheen (1.0,0,0,0,0,1) combined to hold the Lookouts scoreless over the final 5.0 innings in relief. • Of Jackson’s 9 wins, 4 have been come-from-behind victories, including 3 in the 9th this past week. (Down 4-0 Sunday to MIS, won 5-4, down 4-3 Monday and won 6-4 at TNS and down 2-0 Friday and won 5-2 at TNS). • The 9-7 start and 3 straight series’ won is the 2nd best start after 15 games since 2006. In 2012 and 2006 the Generals started 10-5 and in 2012 went on to win the first 5 series’ of the season. • INF Ketel Marte has hit safely in 13 of 15 games with an at-bat, batting .383 (23×60) with 11 runs scored, 5 doubles, 1 RBI, 6 walks and 2 stolen bases. • OF Nate Melendres has hit safely in 6 of 10 games with an at-bat, batting .353 (12×34) with 7 runs scored, 3 doubles, 1 triple, 2 RBI and 3 walks. • After allowing a run in his first appearance of the season, RH Stephen Kohlscheen has not allowed a run over 6.0 innings in relief (5 G), including only allowing 2 base hits over this stretch. Overall this season he is 1-0 with 1 save and a 1.23 ERA (1 ER, 7.1 IP) in 6 relief appearances. He has limited opponents to a .148 average (4×27), while walking 1 and striking out 9. 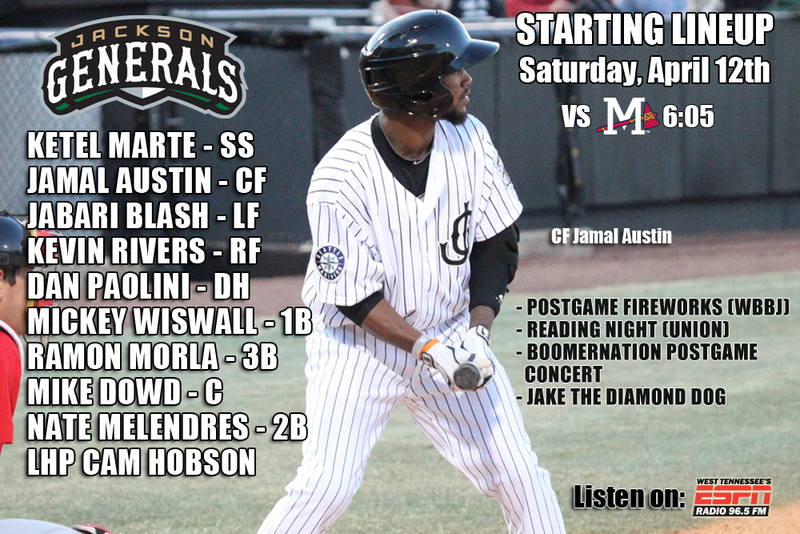 • Currently the Generals are 9-7 and are T-2nd place in the SL North standings, 1.0 game back of 1st place Huntsville. • The Generals offense ranks T-2nd in batting (.251), 1st in doubles (35), 4th in OBP (.338), 4th in total bases (184), and 4th in OPS (.693). • Generals pitching ranks 1st in WHIP (1.01), 1st in hits allowed (101), T-2nd in shutouts with 2, 4th in ERA (3.07), 3rd in runs allowed (53) and posted T-1st fewest walks (39). 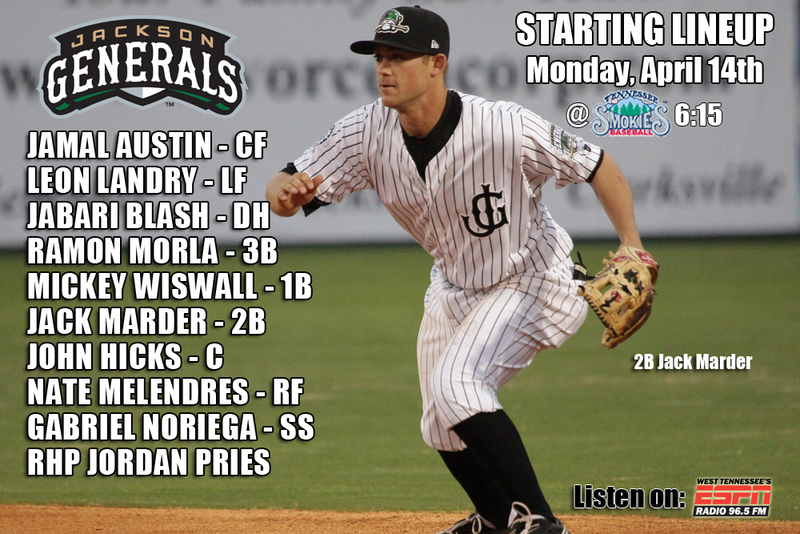 • The Generals meet the Lookouts 15 times during the 2014 season and Jackson has split the season set so far 3-3. Jackson has out-scored the Lookouts 27-18 this season. • The Generals hold a 40-32 record against the Lookouts since 2011. • The Opening Day roster featured 15 players with Double-A experience and 11 that participated in MLB spring training. • The average age is 23.7. The youngest is 19-year-old starter Victor Sanchez and the oldest is 30-year-old reliever Moises Hernandez. • Of the current Mariners roster their are five members of the 2013 Jackson roster. OF Abraham Almonte, OF James Jones, SS Brad Miller, RHP Dominic Leone and LHP Roenis Elias. • The current Mariners roster features 15 former Generals. • Abraham Almonte, Dustin Ackley, Michael Saunders, Nick Franklin, Kyle Seager, Brad Miller, Stefen Romero and Mike Zunino are position players. • Tom Wilhelmsen, Dominic Leone and Yoervis Medina are in the M’s bullpen. 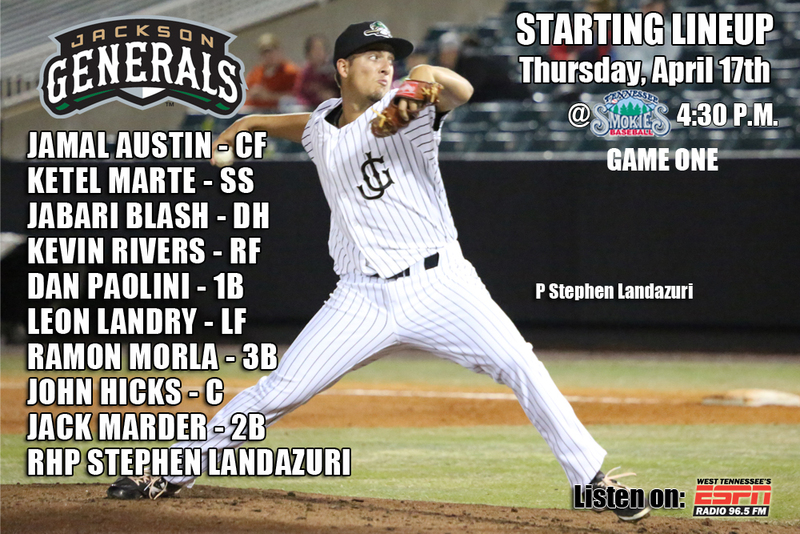 • Tonight the Generals open up a 5-game series with the Chattanooga Lookouts (LAD) at The Ballpark in Jackson. 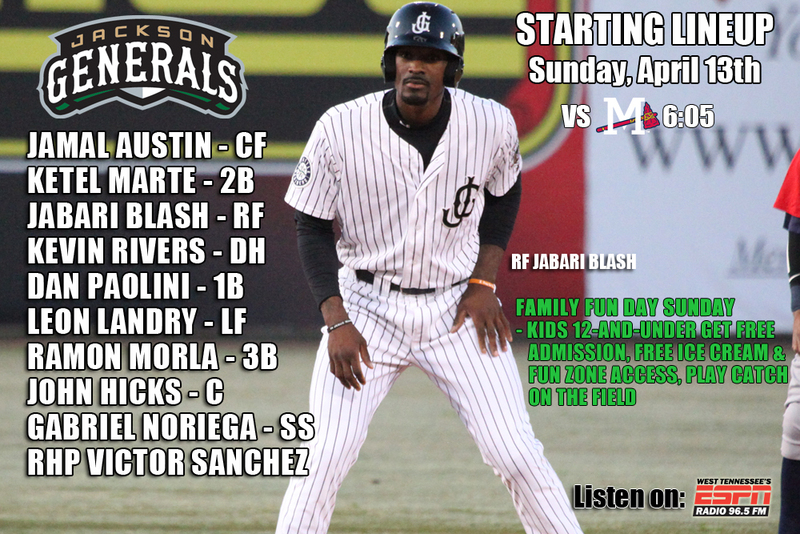 • The Generals come into today’s series opener having won each of the first 3 series’ of 2014 and in 2nd place in the SL North behind Huntsville. 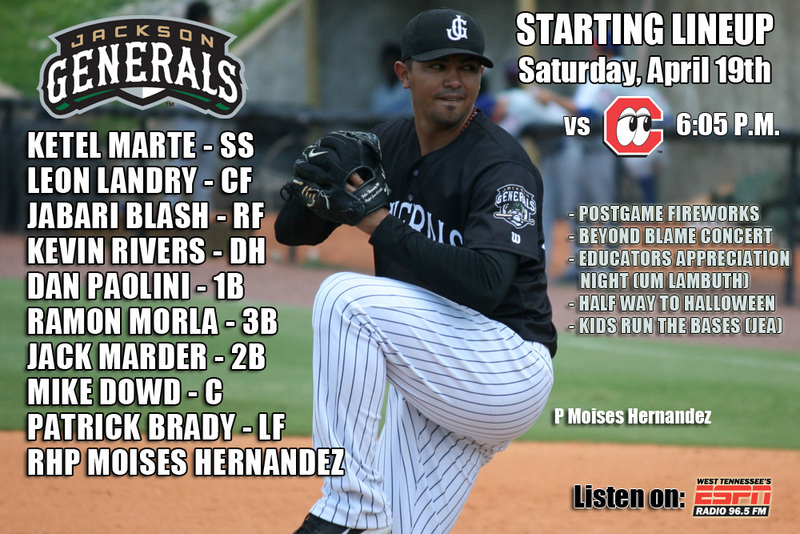 • RHP Moises Hernandez makes the spot start for Jackson against RHP Carlos Frias for Chattanooga. • The Generals scored 5 runs in the top of the 9th as a Jackson came-from-behind to defeat Tennessee 5-2 on Friday. • RF KevinRivers (1×4, R, 2B, 2 RBI) got the Generals on the scoreboard with a 2-run double scoring SS Ketel Marte (1×3, R, BB) and Jabari Blash (1×2, R, 2B, 2 BB). 2-run single scoring 1B Mickey Wiswall (2×4, R) and Hicks. • Starter Cam Hobson (5.2,3,2,2,2,2,HR,2HB) allowed 2 runs on 3 hits in 5.2 innings, but did not figure into the decision. RH Richard Vargas (1.1,0,0,0,0,1) tossed 1.1 scoreless innings in relief, while RH Mayckol Guaipe (2.0,3,0,0,0,4) recorded the win allowing only 3 hit and striking out 4 in 2.0 shutout innings. • After the first 15 games of the 2014 regular season, Jackson has won each game 1,3 and 5 and lost each game 2 and 4 of their repective series’ with Chattanooga, Mississippi and now Tennessee. • The 9-6 start and 3 straight series’ won is the 2nd best start after 15 games since 2006. In 2012 and 2006 the Generals started 10-5 and in 2012 went on to win the first 5 series’ of the season. • INF Ketel Marte has hit safely in 12 of 14 games with an at-bat, batting .386 (22×57) with 10 runs scored, 5 doubles, 1 RBI, 4 walks and 2 stolen bases. • OF Jamal Austin has hit safely in 11 of the first 14 games he has appeared with 5 multi-hit games, batting .298 (17×57) with 5 runs scored, 4 doubles, 7 RBI, 2 walks and 2 stolen bases. • RHP Mayckol Guaipe has not allowed an earned run over 9.1 innings to begin the season (5 G). He has limited opponents .222 (8×36) average, while walking 0 and striking out 9. 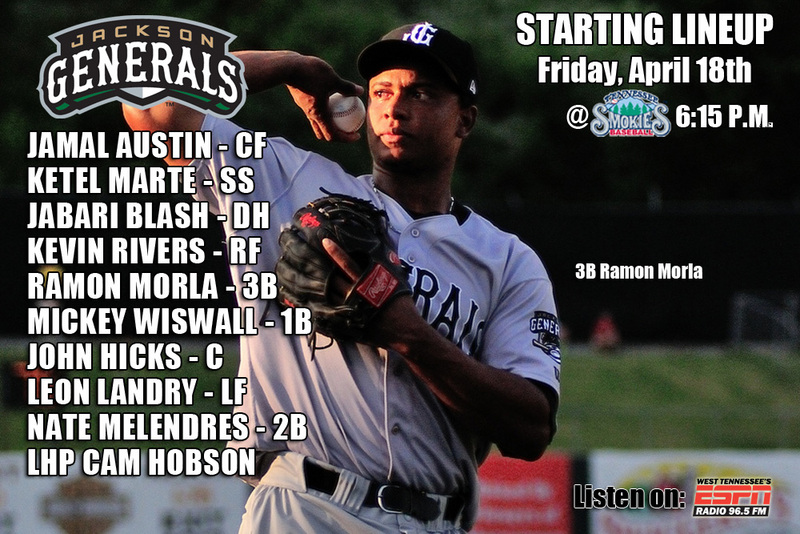 • Currently the Generals are 9-6 and are in 2nd place in the SL North standings, 1.0 game back of 1st place Huntsville. • The Generals offense ranks 2nd in batting (.254), 1st in doubles (35), 2nd in OBP (.336),T-2nd in total bases (178), and 3rd in OPS (.700). • Generals pitching ranks 1st in WHIP (1.04), 2nd in hits allowed (96), T-1st in shutouts with 2, 4th in ERA (3.07), 3rd in runs allowed (50) and posted 2nd-fewest walks (38). • The Generals hold a 40-31 record against the Lookouts since 2011. 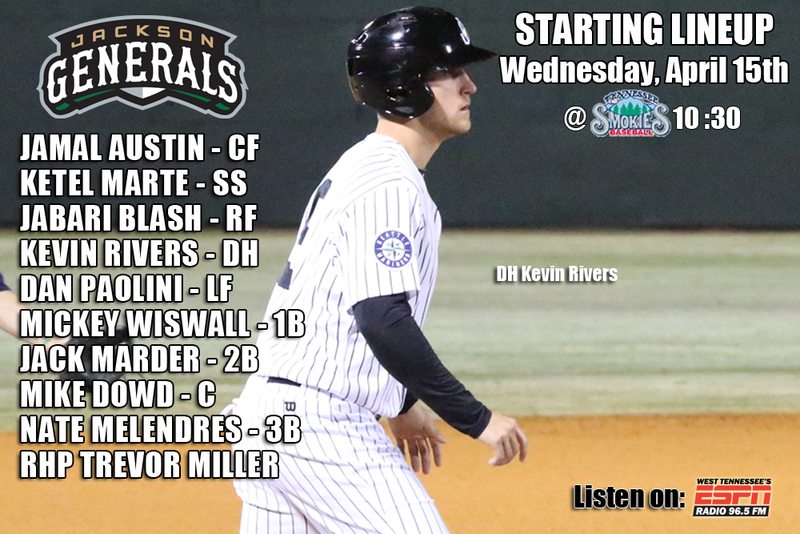 • Tonight the Generals play the rubber match of the 5-game series at Smokies Park against Tennessee with the series even at 2-2. • This is the 3rd straight rubber match of a series to open the season. Jackson is 2-0 having defeated Chattanooga and Mississippi in game 5’s. • Starter Stephen Landazuri and RH Stephen Kohlscheen comined a 1-hit shutout as Jackson defeated Tennessee 4-0 in game 1 of the deoubleheader. Landazuri (6.0,1,0,0,1,9) earned his 2nd win of the season, allowing only 1 hit and striking out 9 in 6.0 shutout innings. Kohlscheen (1.0,0,0,0,1,2) walked 1 and struck out 2 in the 7th inning to secure the win. • DH Jabari Blash (1×3, R, HR, RBI, BB) recorded his 3rd home run of the season with a solo blast to lead off the 5th inning. • The Generals jumped out to an early 2-0 lead in game 2, but allowed 3 unanswered runs as Jackson lost game 2 to Tennessee 3-2 on Thursday night. • SS Ketel Marte (3×4, R, 2B) led the team with 3 hits, while CF Jamal Austin (2×4, R, 2B) and LF Nate Melendres (2×3) each recorded 2 of the Generals 10 hits. Starter Kyle Hunter (2.0,3,0,0,1,2) allowed only 3 hits and struck out 2 in 2.0 scoreless innings. LH Jordan Shipers (2.0,3,3,1,1,2) recorded the loss despite allowing only 1 earned run (3 R) in 2.0 innings. His run in the 3rd inning snapped a string of 7.1 consecutive scoreless innings to begin the season. RH Stephen Shackleford (2.0,0,0,0,1,1) tossed a scoreless 5th and 6th innings. • After the first 14 games of the 2014 regular season, Jackson has won each game 1,3 and 5 and lost each game 2 and 4 of their repective series’ with Chattanooga, Mississippi and now Tennessee. Will in continue? • OF Jamal Austin has hit safely in 11 of the first 13 games he has appeared with 5 multi-hit games, batting .327 (17×52) with 5 runs scored, 4 doubles, 7 RBI, 2 walks and 2 stolen bases. • INF Ketel Marte has hit safely in 11 of 13 games with an at-bat, batting .389 (21×54) with 9 runs scored, 5 doubles, 1 RBI, 3 walks and 2 stolen bases. • OF Nate Melendres has hit safely in 6 of 9 games with an atbat, batting .400 (12×30) with 7 runs scored, 3 doubles, 1 triple, 2 RBI and 3 walks. over 7.1 innings to begin the season (4 G). He has limited opponents .185 (5×27) average, while walking 0 and striking out 5. 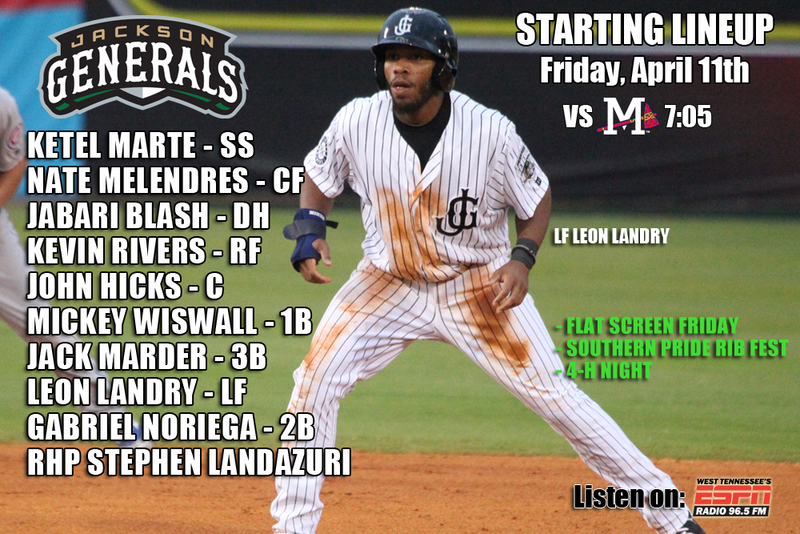 • Currently the Generals are 8-6 and are in 2nd place in the SL North standings, 1.0 game back of 1st place Huntsville. 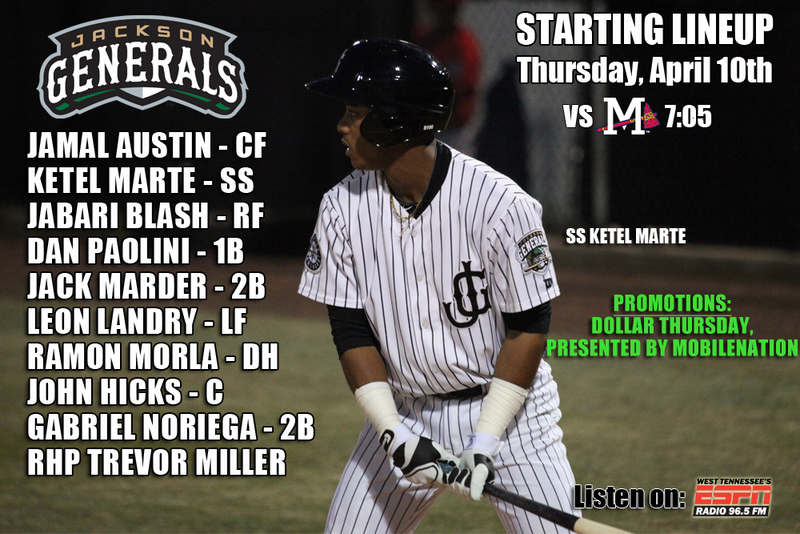 • The Generals offense ranks 2nd in batting (.257), 1st in doubles (32), T-1st in OBP (.341) and 2nd in total bases (168).